It’s my fault that we’ve had the flu bad this season and I know exactly why. I had so many winters where we didn’t get the flu that I got lazy and stopped doing all those things that keep us from getting it, so now here I am stuck Fighting the Flu Naturally again. First of all it’s way better to prevent the flu than to fight it. So we’ll go over the best preventative natural medicine for the flu and then we’ll go over what to do once you’ve got it. Fenugreek, Peppermint Tea- this is a serious flu fighter tea and can totally keep the flu away too. I boil a big soup pot of water (or my crockpot). Once the water is boiling I add 1/2 cup of fenugreek and 1/2 cup of peppermint to it. I turn off the heat and cover for at least 1 hour. This pot will last me all day, sometimes two. Apple Cider Vinegar- Drink at least 1 tbs of apple cider vinegar per cup of water 6x day. This kills any virus as soon as it’s entered your body, so it doesn’t get a chance to multiply and replenish giving you the flu. Cayenne Pepper & Ginger Tea- Boil enough hot water to fill a quart jar. Add 1/2 fresh lemon juice, hunk of grated ginger, and a dash of cayenne pepper. Throw everything into a jar and cover in the boiling water. Let it steep for a couple of hours and drink it all day. It’s spicy but powerful! Eat good simple foods that will strengthen your body, including organic chicken broth, local honey, and lots of fresh vegetables. Okay, so you’ve got the flu? I’m sorry to hear that. Hopefully here are some things that can help you kick it quick. Continue taking all the flu busting teas that I mentioned above. Add these things to your regular routine as well. Oil of Oregano-Rub onto feet 4x a day, or mix a few drops with butter and spread on toast 4x a day. This stuff is hot & strong so be careful. It contains thymol and carvacrol which are both antimicrobial and antiseptic which means it can stop the spread of the virus in your body. Oregano is well known for it’s ability to fight infection and is an effective remedy for sore throats, sinus congestion, & indigestion. Peppermint Oil- This is excellent to combat fever, stomach ache, & nausea. Dilute it 10 drops of peppermint to 4 tsp olive oil and rub it onto the bottoms of your feet & your forehead for fevers, and onto your stomach for nausea & stomach aches. Mullein Tea-Boil enough water to fill a quart jar, add a handful of dried or fresh mullein leaves and cover. Let steep for 1 hour. Add some fresh local honey and drink 4x a day. Mullein leaf has a mucilage content that soothes, and coats irritated bronchial membranes. It works great on coughs because it liquefies mucus making your coughs more productive. As a tea, mullein is used to treat flu and respiratory illness. Mullein also reduces inflammation of the bronchial and allows for better breathing while it reduces pain and irritation. Mullein leaf is also an immune enhancer. Yay! It is also suggested that Mullein leaf can help asthma (but please see a doctor right away if you suffer from asthma!). As a diuretic mullein leaf purifies the blood by removing toxins through the kidney. Tea Tree & Eucalyptus Oil- For congestion the inhalation of tea tree, eucalyptus oils can be very useful. Take a pot of boiling water off of the stove. Add 10 drops each of the oils and breathe in the steam as it comes out. Be careful not to burn yourself. Inhaling can clear your throat and chest quickly & effectively. 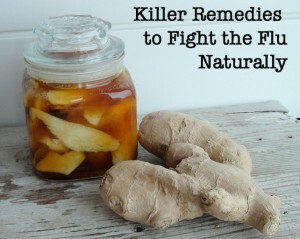 Okay, what are your favorite flu busting recipes which aid in Fighting the Flu Naturally? I’d love you share!